Ospreys were extinct as breeder in mainland Spain since the 80s, while the island population (Canary and Balearic Islands) were classified as “endangered”. The status of the species in the Mediterranean basin is critical because of their small and highly fragmented population. In order to increase long-term chances of survival of this species and recover it as breeder on the Iberian Peninsula, the Andalusian government, the Biological Station of Doñana (CSIC) and Migres Foundation began the project to reintroduce the species in 2002. 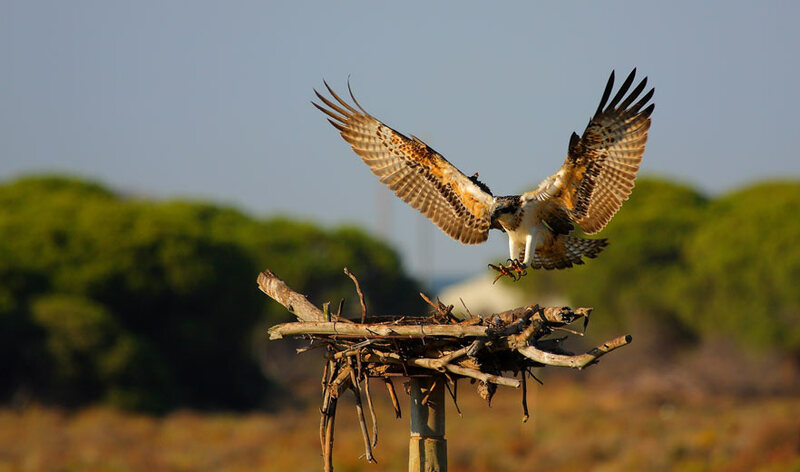 Until 2012 almost 200 osprey chicks from Finland, Scotland and Germany were released in Cádiz (Barbate Reservoir) and Huelva (Marismas del Odiel Natural Park).Thanks to all the efforts made in recent years, there is now a well-established and growing breeding Osprey population. Thanks to all the efforts made in recent years, there is now a well-established and growing breeding Osprey population.